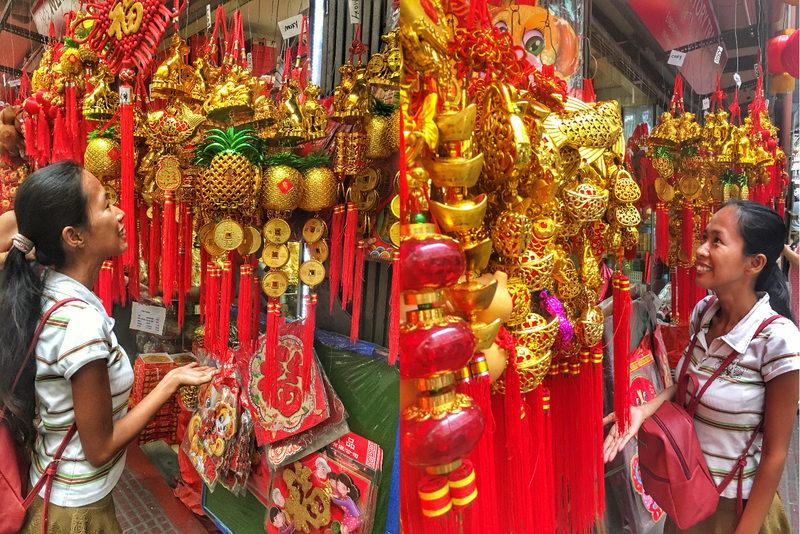 Looking for a Binondo food trip itinerary this Chinese New Year and Valentines Day? You're on the right page. It is my yearly vow to go to Manila's Chinatown during Chinese New Year celebration to visit my favorite restaurants and discover new ones as well. I have been craving for Chinese food so bad that I need to follow where my stomach wants me to go. For the past two years, I was out of the country during this season that's why I was not able to do so. This 2018, I found one more reason to choose Manila as my home base and eventually turned my back to a job in Thailand all because of meeting this guy through a dating app. It has been six months since we both swiped right to each other and not regretting every single moment with him. He is a certified foodie so I really plan to bring him in Binondo Chinatown soon. Together with my blogger friends, we finally turned our plans to reality by organizing our very own version of the ultimate Binondo food trip that happened yesterday! 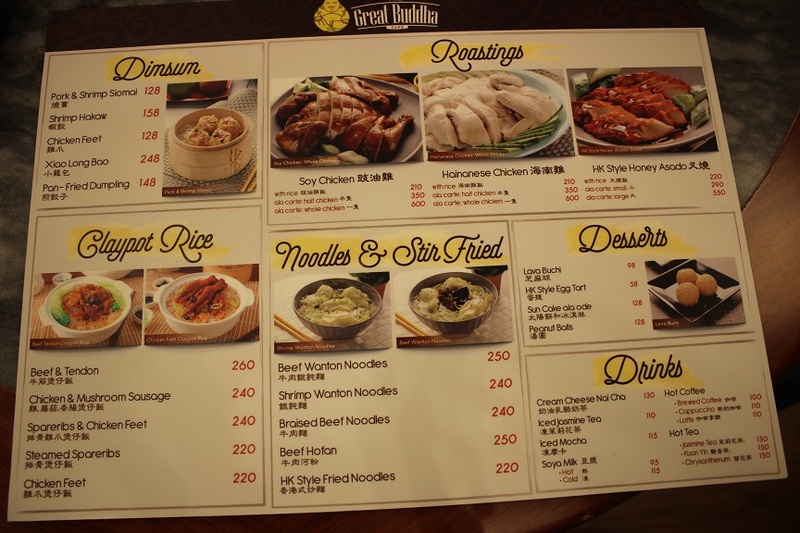 We visited three oldest and most favorite Chinese restaurants in Binondo plus one that opened just a few days ago. 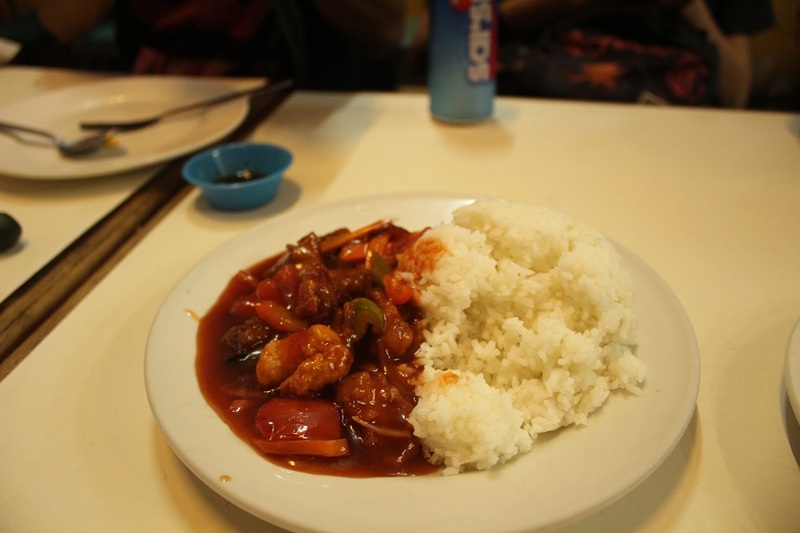 We mostly wanted to eat at an affordable Chinese restaurant in Binondo that is not going to rip our pockets. Our Binondo food trip budget for each of us should not be more than Php 1, 000. This amount actually is enough to eat at some of Binondo's famous restaurants. 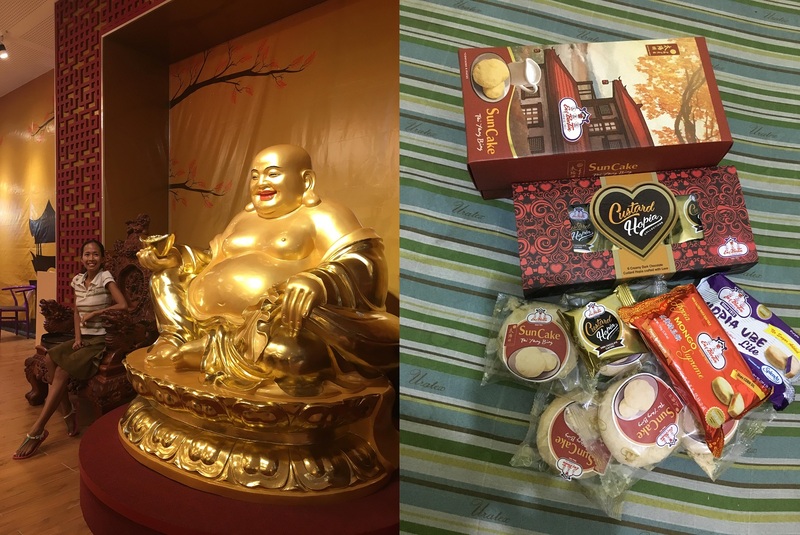 I am quite familiar of the right prices of the food sold in Binondo because for a few years I used to assist a fellow blogger to organize a Binondo food tour package. For those who have no time to do it DIY, click HERE to join this Binondo Food Tour Package I can recommend. If you have want to visit more restaurants in Binondo, click HERE to read 10 BEST RESTAURANTS FOR CHINATOWN BINONDO FOOD TOUR. 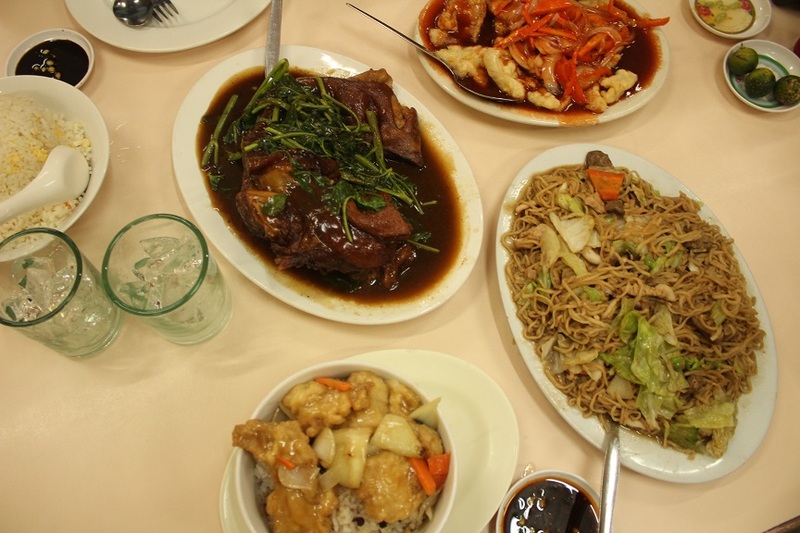 Here are the 4 restaurants in Binondo Chinatown we'd love to eat over and over again! The chronological order of restaurants we at: Ramon Ang Panciteria, New Toho Center, Nossppe Eatery and The Golden Buddha Cafe. Note: I put The Golden Buddha Cafe on top list even though that's the last one we visited because it is my most recommended Chinese restaurant in terms of food, environment and service. 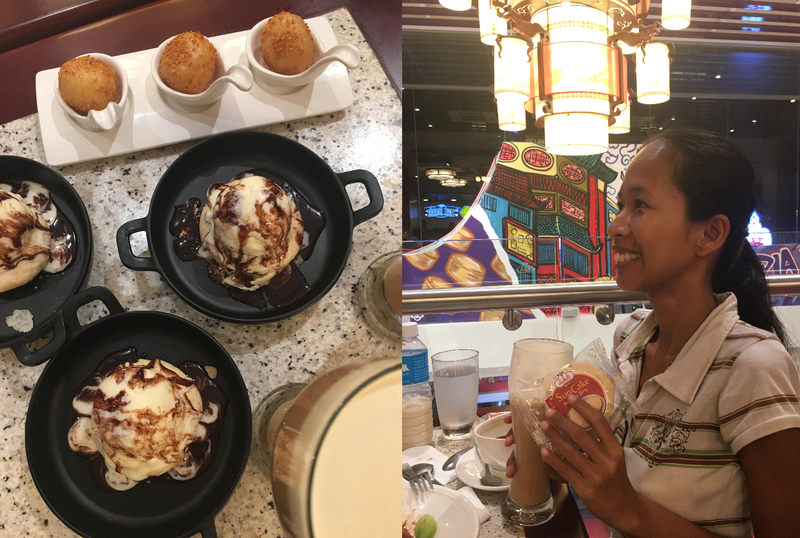 We are nearly going to food coma so we decided to just grab desserts and sweets in Binondo's newly opened restaurant. I have second thoughts to spend our last few hours here because yes, it just opened but I WAS TOTALLY BLOWN AWAY. The usual Binondo Chinese restaurant is dull but this one is certified Instagrammable. They have free wifi and there's even an escalator to get to the second floor where the view is much better. We ordered Cream Cheese Nai Cha for drinks which is cold milk tea topped with a layer of cream cheese. 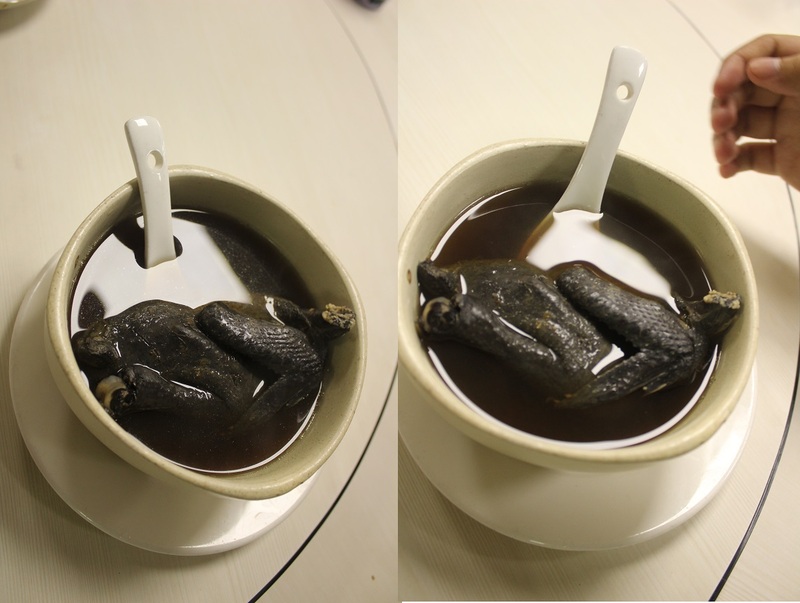 According to a netizen, there here are several ways to enjoy this. 1) hold the glass and sip the milk tea thru the creamy layer of cream cheese. There is an orchestra of flavors, you taste the cream with a hint of salt of the cream cheese and the aroma of tea with milk. 2) drink this unmixed with a straw, start from the bottom to savor the slightly sweet milk tea, as you consume the milk tea, you are left with the undisturbed layer of cream cheese, you will enjoy the creamy slightly salty liquid cheese. 3) mix everything together with a stirrer and enjoy the different flavors bursting in your taste buds and sense of smell. We also chose Sun Cake ala Mode for desserts. I actually wanted to try the HK Style Egg Tart which was my favorite to eat when I was in Hong Kong but it was out of stock. You know what? Our second choice turned out to be the best! I mean I know how does an egg tart tastes but for a sun cake topped with ice cream, not yet! We also got to try panfried dumplings, hakaw and siomai and HK style honey asado with rice. What I like about this modern restaurant in Binondo is that it is stylish in terms of design and architecture. The whole place was cozy and wide - airconditioned and exudes a vibrant place. 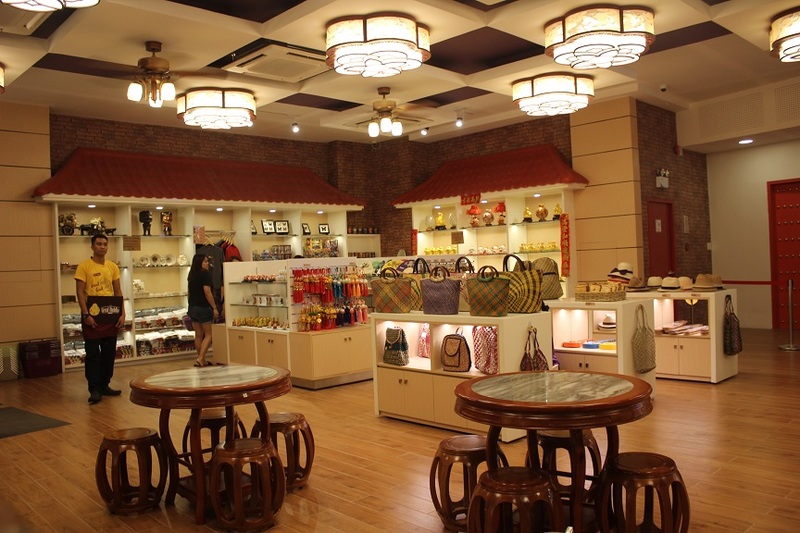 There's also a gift/pasalubong shop selling trendy native products that promote Filipino craftmanship. We met no other than one of Binondo's iconic businessman, Mr. Gerry Chua who is the man behind successful businesses in this area like the Mr. Ube, Eng Bee Tin and more. He talked to us how he grew his business from scratch. This guy is a perfect example of a person who never gave up to pursue his dreams. Having reached the pinnacle of his success and has passed the torch to his 3 kids to run this business, he now devotes his time to fight fire outbreaks in Manila. Ramon Lee's Panciteria is one of Binondo's oldest restaurants. It started operating in 1929 as a small panciteria back when life was simpler and traffic was nonexistent. 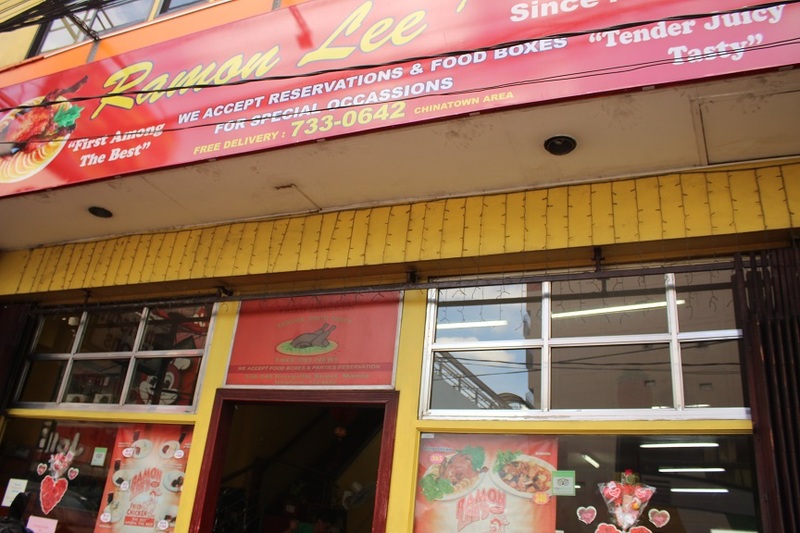 Ramon Lee was a Chinese who moved to the Philippines eventually opening a restaurant with his wife. 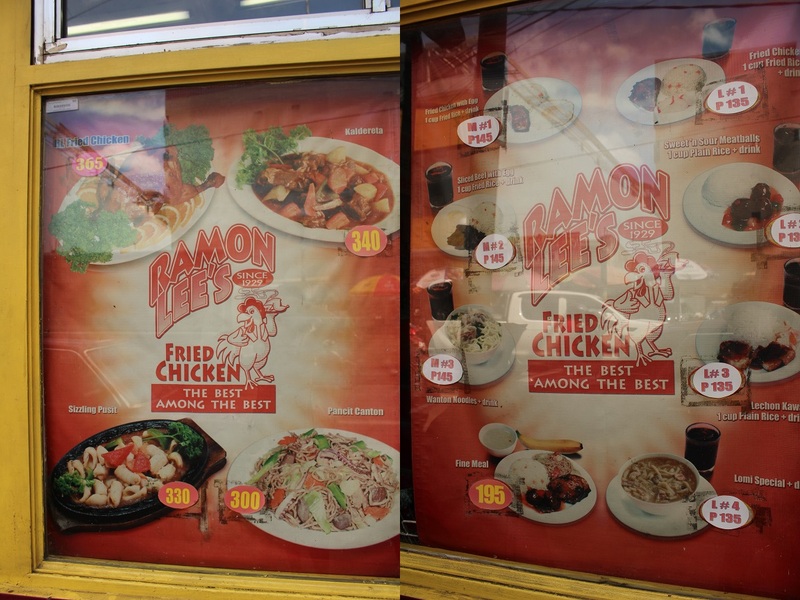 They are known for their pancit dishes, lumpias and their famed fried chicken. We came as a group of 4 pax then later on joined by 2 more. 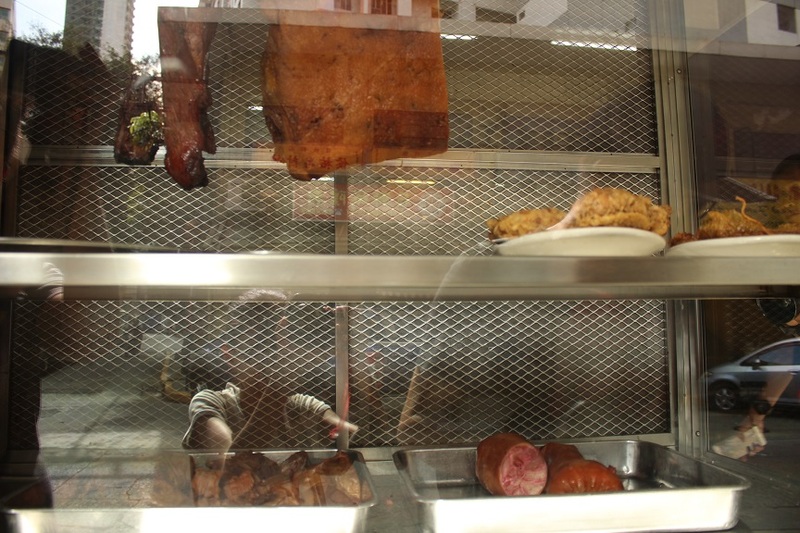 The pata tim is heaven for those who love pork. It is to tender that you don't have to stress yourself to cut it in pieces using the knife. They are really true, their pancit dishes are to die for! My order was the tauis fish fillet which you have to pair with the fried rice. So good! However, the sweet n sour dish came a bit short according to one of our food buddies. It was a bit sweeter than being a combination of how it was named. This panciteria in Binondo has been visited by some of the country's famous personalities such as Former President Ferdinand Marcos, Ces Drilon, Vilma Santos, Korina Sanchez and more. Ramon Lee's Panciteria 's address is at Ronquillo St. near Sta. Cruz fountain and Chinese arc. 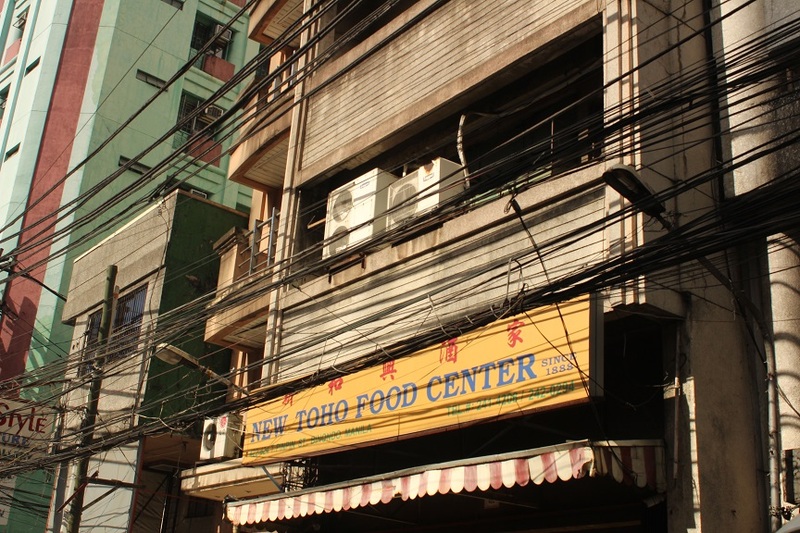 Antigua New Toho Center is one of the oldest restaurants in Binondo, Manila. Started in 1888, I have heard of stories that even Dr. Jose Rizal, katipuneros , Andres Bonifacio & his wife, Ex Manila Mayor Arsenio Lacson, Fernando Poe Sr., Fernando Poe Jr. and also Philippine Comedy King Dolphy used to dine here. I have eaten here many times for the past few years whenever Rence, a freelance Binondo tour guide would bring groups of hungry people wanting to taste Chinese food. We were still full from the first restaurant we ate so we ordered fewer food. I super love the kikiam here! The kikiam that is sold in the streets of the whole Philippines will be ashamed as to how it is gazillion times better than the one they cook here. The Canton Prito is also a winner. Never had this before honestly. It's a plate of stir-fried noodles that is so crunchy, you can eat it yourself or better yet pour some hot soup made of veggies that taste close to chopsuey. Lechon kawali needs no pushing - we all love this sinful food. The sweet n sour pork rice that we also tasted from the first restaurant came as perfect for our palate this time! Don't forget, my two best-recommended food to eat at New Toho Center are kikiam and canton prito! Photos above are a plate of kikiam and the sweet n sour pork rice. I regret not being able to take photos of the Canton Prito but I beg you to order it! You won't regret. Location - From the Binondo Chinese Arc, you'll have to walk for 20 - 30 minutes to get here so prepare to exercise your feet a little. The family that runs the business is already the 4th generation but the taste and the food preparation is still very much the same from the beginning as told by one of our buddies who have been eating in Binondo for a few decades. This third restaurant was the hardest for us to find because its name is in Chinese. Only then we knew its English name when we got inside - it was printed in the menu list. Since we're full and this is our third Chinese restaurant in Binondo, we just want to eat light and let our stomach digest what we ate. 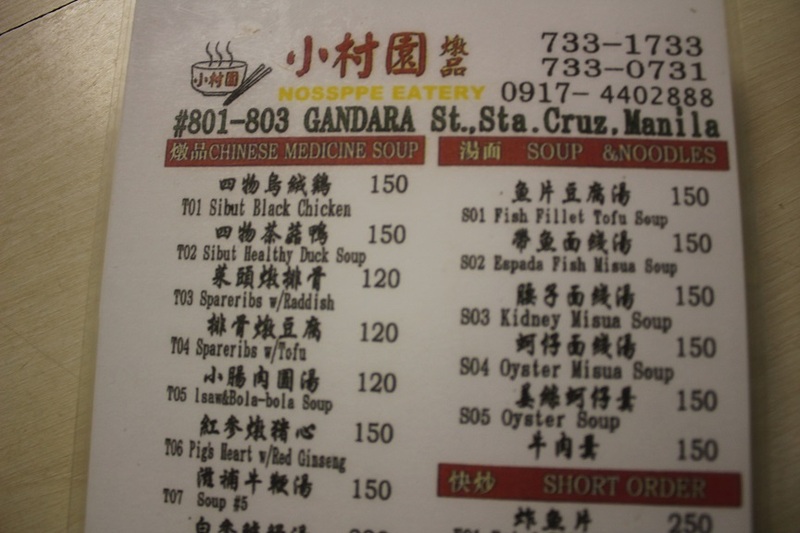 This restaurant is known for serving Chinese medicine soup so we ordered the Sibut Black Chicken (Php 150), oyster cake (Php 150) and cans of gulaman grass jelly Php 40. We learned that a famous Western food blogger featured Nosspe Eatery before for this medicinal soup alone that's why we never had second thoughts about it. The soup is aromatic because of a certain medicinal wood that is imported all the way from China. This bowl of one Sibuk chicken is only good for 1-2 persons but since we are so full, we just want to eat light and let the food in our stomach be digested as fast as it can. We still have the fourth and last restaurant to eat after this! For some reasons, I couldn't find the oyster cake and the can of gulaman grass jelly we ordered! Both of these are also worth eating at Nossppe Eatery. The woman at the cashier's desk speaks Tagalog but the accent is very Chinese. Good thing, their servers are Filipinos who can talk to us in Tagalog. Nossppe Eatery is located in #801-803 Gandara St. Santa Cruz, Manila.